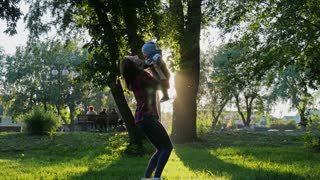 Happy young mother playing with her little baby son on sunshine warm autumn or summer day. Happy family concept. Young mother playing with her little baby son. Playing with autumn leaves. Young mother with her little baby playing in the autumn park on sunset. 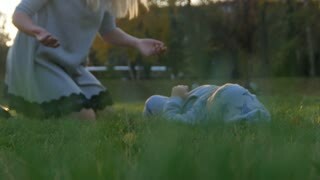 Baby lies on the grass.